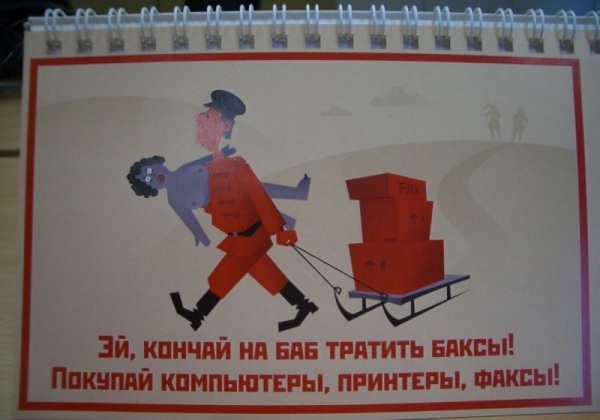 This is a calendar published in Russia. 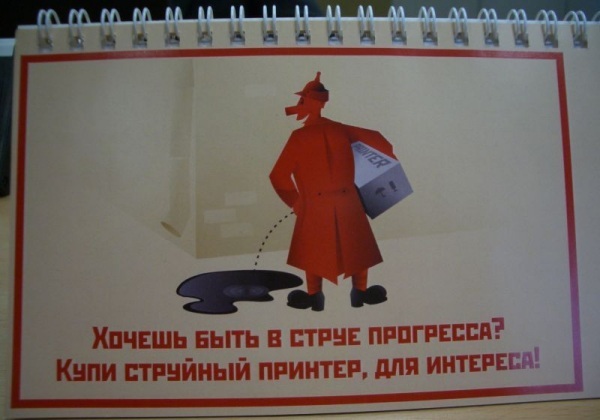 It was styled to old style Soviet posters but with IT thematic. 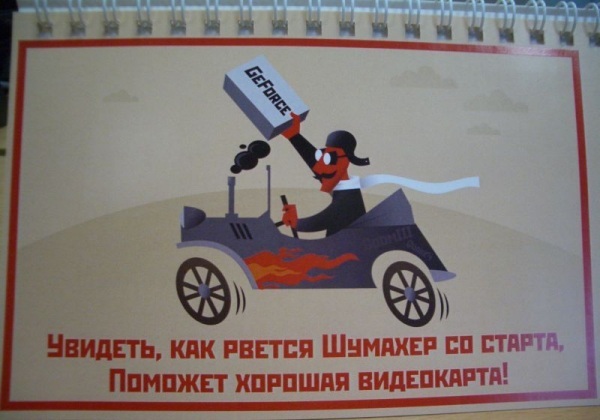 Also a poetic slogans are added to each image styled to Soviet era drive poetry. “I don’t visit any more rally! 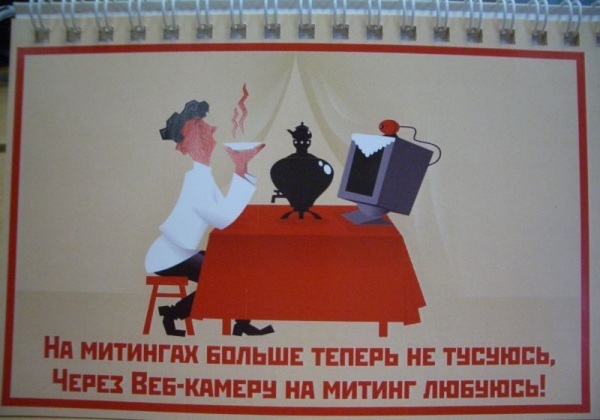 This thing on the table is “Samovar”. It was a traditional Russian water boiler for making a tea. “Worked hard at night till an end whistle? Note a Windows sign on the machine. “Your connection is broke by an office-cleaner? 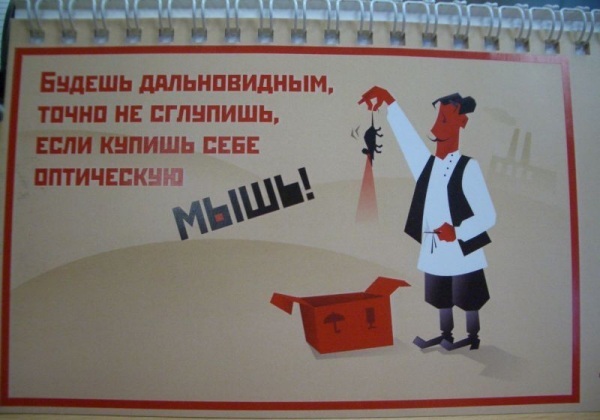 “Want to revenge to a neighbour dog? “Want to be in a progress stream? Lenin should be a Quake fan. There are 3 Quake logos on the picture. “Want to join the race? “Don’t go to the club at night! “Stop wasting to the ladies your bucks! 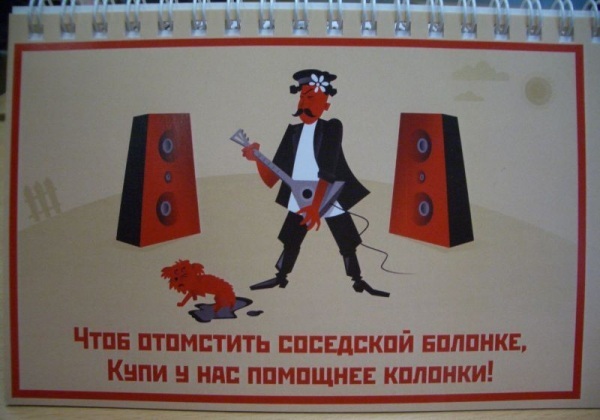 Probably if they could provide an English translated version of this calendar they could get a much bigger market for it. 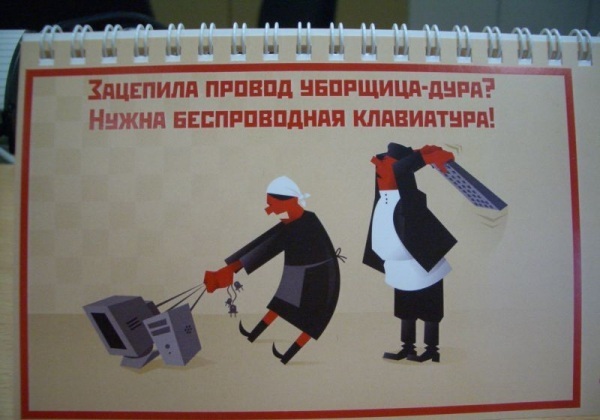 Also, “klaviatura” is very definitely “keyboard”, not “spinner”. Kudos on the rhyming translations! Of course it’s less accurate, but hey, who cares, it’s well done. 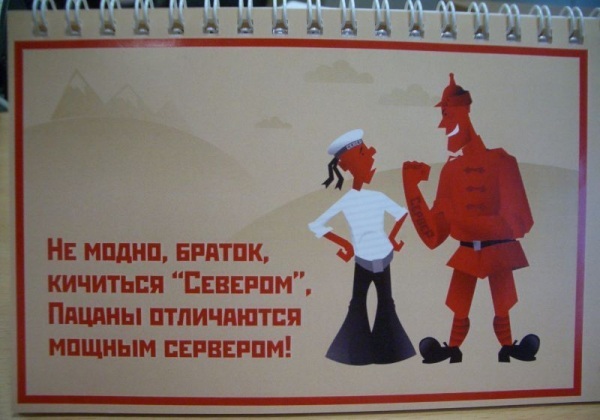 I suspect that “North” (“Sever”, “Север”) is a brand of cigarettes, a little finer than typical proletarian “Belomor”. Translation is very bad. It should be. Want to be in stream of progress? I know it sounds better when it rhymes but when you translate it incorrectly it just doesnt make sense. 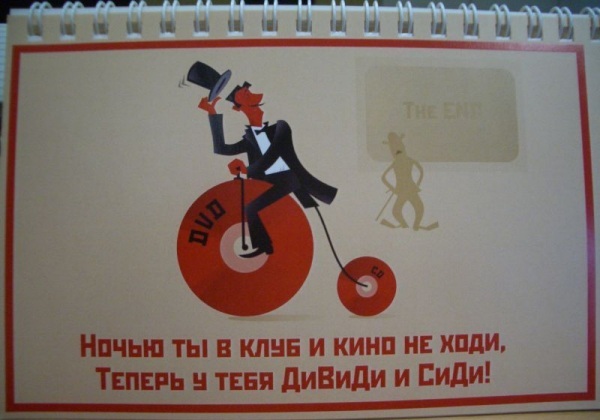 Translation is not word-by-word, but it is perfect! Great work! Excelent translation, keep on like that! I love the stylized art, very interesting. It is a I enjoy a few of the articles which were written, and especially the comments posted! I am going to come back! It is a I adore many of the articles that have been written, and especially the comments posted! I’ll come back! Easily, the post is actually the greatest on this deserving topic. I fit in with your conclusions and will eagerly look forward to your forthcoming updates. Saying thanks will not just be enough, for the wonderful clarity in your writing. I will immediately grab your rss feed to stay informed of any updates. Good work and much success in your business endeavors! The reason a lot of rallies don’t work nowadays is because people have so many “virtual rallies” across the internet. Look at Facebook and all it’s groups that are presumabely intended to fight a good cause. They’re rubbish, pointless, nobody takes any notice of them. People just join a group and like to think it’s doing some good when it’s not. 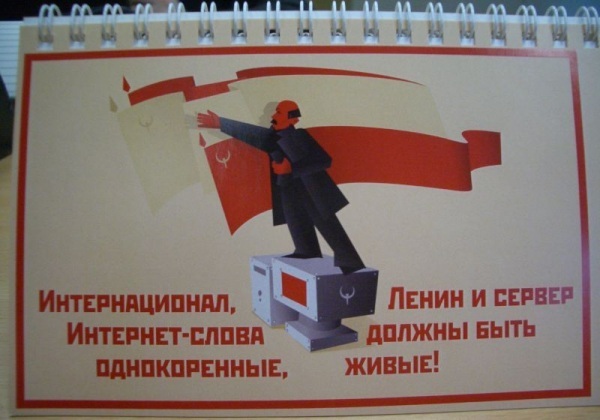 The first translation, about the webcam being the rally, is very true!